Head Labrarian at The Labrary, the place where the library and the laboratory converge to help your software team. I run a company, a mission-driven software consultancy that aims to make it easier and faster to make high-quality software that preserves privacy and freedom. On the homepage you’ll find Research Watch, where I talk about research papers I read. For example, the most recent article is Runtime verification in Erlang by using contracts, which was presented at a conference last year. Articles from the last few decades are discussed: most is from the last couple of years, nothing yet is older than I am. 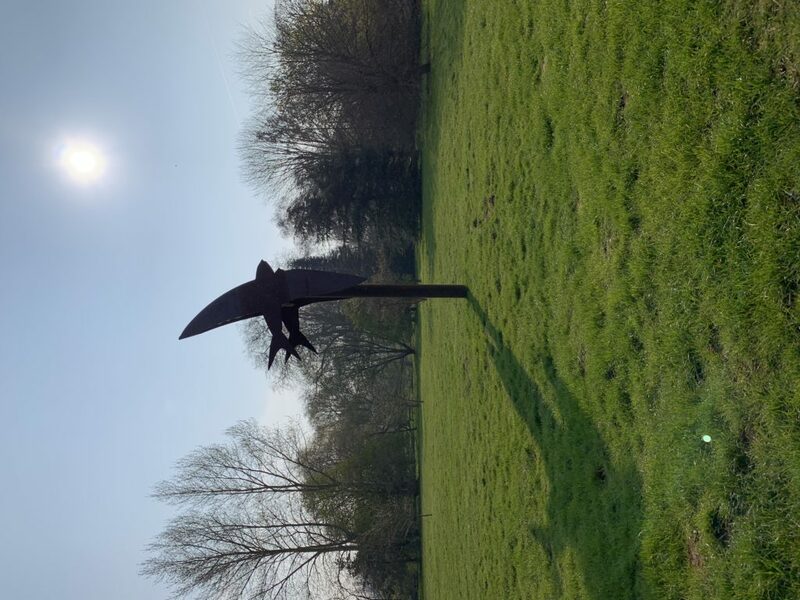 At de Programmatica Ipsum, I write on “individuals, interactions, and the true valuation of the things on the left” with Adrian Kosmaczewski and a glorious feast of guest writers. The most recent issue was on work, the upcoming issue is on programming history. You can subscribe or buy our back-catalogue to read all the issues. Anyway, those are other places where you might want to read my writing. If people are interested I could publish their feeds here, but you may as well just check each out yourself :). When you’re writing Python tutorials, you have to use Monty Python references. It’s the law. On the 40th anniversary of the release of Monty Python’s Life of Brian, I wanted to share this example that I made for collections.defaultdict that doesn’t fit in the tutorial I’m writing. It comes as homage to the single Eric the Half a Bee. return "Is a bee" if self.is_a_bee else "Not a bee"
Dictionaries that can return different values for the same key are a fine example of Job Security-Driven Development. King Arthur: By what name are you known? Why is it we’re not allowed to call the Apple guy “Tim Apple” when everybody calls the O’Reilly guy “Tim O’Reilly”? So essentially when someone says something is unpythonic, they are saying that the code could be re-written in a way that is a better fit for pythons coding style. We saw in Apple’s latest media event a lot of focus on privacy. They run machine learning inferences locally so they can avoid uploading photos to the cloud (though Photo Stream means they’ll get there sooner or later anyway). My Twitter stream frequently features adverts from Apple, saying “we don’t sell your data”. Of course, none of the companies that Apple are having a dig at “sell your data”, either. That’s an old-world way of understanding advertising, when unscrupulous magazine publishers may have sold their mailing lists to bulk mail senders. These days, it’s more like the postal service says “we know which people we deliver National Geographic to, so give us your bulk mail and we’ll make sure it gets to the best people”. Only in addition to National Geographic, they’re looking at kids’ comics, past due demands, royalty cheques, postcards from holiday destinations, and of course photos back from the developers. To truly break the surveillance capitalism economy and give me control of my data, Apple can’t merely give me a private phone. But that is all they can do, hence the focus. Going back to the analogy of postal advertising, Apple offer a secure PO Box service where nobody knows what mail I’ve got. But the surveillance-industrial complex still knows what mail they deliver to that box, and what mail gets picked up from there. To go full thermonuclear war, as promised, we would need to get applications (including web apps) onto privacy-supporting backend platforms. But Apple stopped selling Xserve, Mac Mini Server, and Mac Pro Server years ago. Mojave Server no longer contains: well, frankly, it no longer contains the server bits. And because they don’t have a server solution, they can’t tell you how to do your server solution. They can’t say “don’t use Google cloud, it means you’re giving your customers’ data to the surveillance-industrial complex”, because that’s anticompetitive. At the Labrary, I run my own Nextcloud for file sharing, contacts, calendars, tasks etc. I host code on my own gitlab. I run my own mail service. That’s all work that other companies wouldn’t take on, expertise that’s not core to my business. But it does mean I know where all company-related data is, and that it’s not being shared with the surveillance-industrial complex. Not by me, anyway. There’s more to Apple’s thermonuclear war on the surveillance-industrial complex than selling privacy-supporting edge devices. That small part of the overall problem supports a trillion-dollar company. It seems like there’s a lot that could be interesting in the gap. We were promised a bicycle for our minds. What we got was more like a highly-efficient, privately run mass transit tunnel. It takes us where it’s going, assuming we pay the owner. Want to go somewhere else? Tough. Can’t afford to take part? Tough. Bicycles have a complicated place in society. Right outside this building is one of London’s cycle superhighways, designed to make it easier and safer to cycle across London. However, as Amsterdam found, you also need to change the people if you want to make cycling safer. Changing the people is, perhaps, where the wheels fell off the computing bicycle. Imagine that you have some lofty goal, say, to organise the world’s information and make it universally accessible and useful. Then you discover how expensive that is. Then you discover that people will pay you to tell people that their information is more universally accessible and useful than some other information. Then you discover that if you just quickly give people information that’s engaging, rather than accessible and useful, they come back for more. Then you discover that the people who were paying you will pay you to tell people that their information is more engaging. Then you don’t have a bicycle for the mind any more, you have a hyperloop for the mind. And that’s depressing. But where there’s a problem, there’s an opportunity: you can also buy your mindfulness meditation directly from your mind-hyperloop, with of course a suitable share of the subscription fee going straight to the platform vendor. No point using a computer to fix a problem if a trillion-dollar multinational isn’t going to profit (and of course transmit, collect, maintain, process, and use all associated information, including passing it to their subsidiaries and service partners) from it! It’s commonplace for people to look backward at this point. The “bicycle for our minds” quote comes from 1990, so maybe we need to recapture some of the computing magic from 1990? Maybe. What’s more important is that we accept that “forward” doesn’t necessarily mean continuing in the direction we took to get to here. There are those who say that denying the rights of surveillance capitalists and other trillion-dollar multinationals to their (pie minus tiny slice that trickles down to us) is modern-day Luddism. It’s a better analogy than they realise. Luddites, and contemporary protestors, were not anti-technology. Many were technologists, skilled machine workers at the forefront of the industrial revolution. What they protested against was the use of machines to circumvent labour laws and to produce low-quality goods that were not reflective of their crafts. The gig economies, zero-hours contracts, and engagement drivers of their day. We don’t need to recall the heyday of the microcomputer: they really were devices of limited capability that gave a limited share of the population an insight into what computers could do, one day, if they were highly willing to work at it. Penny farthings for middle-class minds, maybe. But we do need to say hold on, these machines are being used to circumvent labour laws, or democracy, or individual expression, or human intellect, and we can put the machinery to better use. Don’t smash the machines, smash the systems that made the machines. In the world of blogging ‘0 Comments’ is an unambiguous statistic that means absolutely nobody cares. The awful truth about blogging is that there are far more people who write blogs than who actually read blogs. It’s been a very difficult decision (I love reading comments on my articles, and they’re almost unfailingly insightful and valuable), but I’ve finally switched comments off. having comments switched off dilutes the experience for those people who did want to see what people were talking about. There’d be some chat over on twitter (some of which mentions me, some of which doesn’t), and some over on the blog’s Facebook page. Then people will mention the posts on their favourite forums like Reddit, and a different conversation would happen over there. None of that will stop with comments on, and I wouldn’t want to stop it. Having comments here should guide people, without forcing them, to comment where everyone can see them. This analysis still holds. People comment on my posts over at Hacker News and similar sites, whether I post them there or not. The sorts of comments that you would expect from Hacker News commenters, therefore, rarely appear here. They appear there. I can’t stop that. I can’t discourage it. I can merely offer an alternative. While opinions on the exact numerical specifications of The Ratio vary, in short, it goes something like this: If the number of replies to a tweet vastly outpaces its engagement in terms of likes and retweets, then something has gone horribly wrong. So now saying something that people want to talk about, which in 2005 was a sign that they cared, is a sign that you messed up. The goal is to say things that people don’t care about, but will uncritically share or like. If too many people comment, you’ve been ratioed. I don’t really have a “solution”: there may be human solutions to technical problems, but there aren’t technical solutions to human problems. And it seems that the humans on the web have a problem that we want an indication that people are interested in what we say, but not too much of an indication, or too much interest. To this day, many Smalltalk projects have a hot air balloon in their logo. 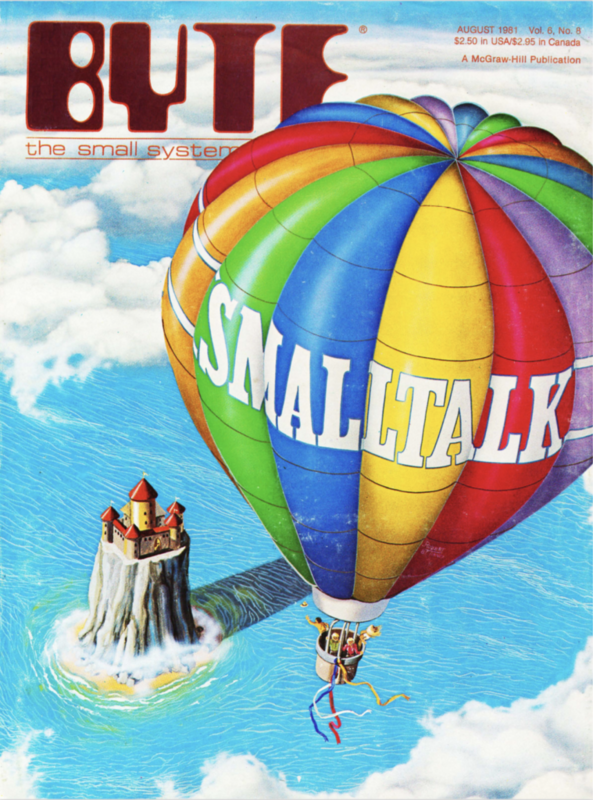 These reference the cover of the issue of Byte Magazine in which Smalltalk-80 was shared with the wider programming community. Modern Smalltalks all have a lot in common with Smalltalk-80. Why? If you compare Smalltalk-72 with Smalltalk-80 there’s a huge amount of evolution. So why does Cincom Smalltalk or Amber Smalltalk or Squeak or even Pharo still look quite a lot like Smalltalk-80? Basically what happened is this vehicle became more and more a programmer’s vehicle and less and less a children’s vehicle—the version that got put out, Smalltalk ’80, I don’t think it was ever programmed by a child. I don’t think it could have been programmed by a child because it had lost some of its amenities, even as it gained pragmatic power. So the death of Smalltalk in a way came as soon as it got recognized by real programmers as being something useful; they made it into more of their own image, and it started losing its nice end-user features. I think there are two different things you want from a programming language (well, programming environment, but let’s not split tree trunks). Referencing the ivory tower on the Byte cover, let’s call them “academic” and “industrial”, these two schools. The industrial ones are out there, being used to solve problems. They need to be stable (some of these problems haven’t changed much in decades), easy to understand (the people have changed), and they don’t need to be exciting, they just need to work. Cobol and Fortran are great in this regard, as is C and to some extent C++: you take code written a bajillion years ago, build it, and it works. The academic ones are where the new ideas get tried out. They should enable experiment and excitement first, and maybe easy to understand (but if you need to be an expert in the idea you’re trying out, that’s not so bad). the people who have used the language as a tool to solve problems won’t appreciate it if new ideas come along that mean they have to work to get their solution building or running correctly, again. the people who have used the language as a tool to explore new ideas won’t appreciate it if backwards compatibility hamstrings the ability to extend in new directions. metaprogramming. Lisp in particular is great at having a little language that you can use to solve your problems, and that you can also use to make new languages or make the world work differently to see how that would work. Of course, if you can change the world then you can break the world, and Lisp isn’t great at making it clear that there’s a line between following the rules and writing new ones. pragmas. Haskell in particular is great at having a core language that people understand and use to write software, and a zillion flags that enable different features that one person pursued in their PhD that one time. Not all of the flag combinations may be that great, and it might be hard to know which things work well and which worked well enough to get a dissertation out of. But these are basically the “enable academic mode” settings, anyway. versions. Perl and Python both ran for years in which version x was the safe, stable, industrial language, and version y (it’s not x+1: Python’s parallel versions were 2 and 3000) in which people could explore extensions, removals, or other changes in potentially breaking ways. At some point, each project got to the point where they were happy with the choices, and declared the new version “ready” and available for industrial use. This involved some translation from version x, which wasn’t necessarily straightforward (though in the case of Python was commonly overblown, so people avoided going from 2 to 3 even when it was easy). People being what they are, they put a lot of store in version numbers. So some people didn’t like that folks were recommending to use x when there was this clearly newer y available. FFIs. You can call industrial C89 code (which still works after three decades) from pretty much any academic language you care to invent. If you build a JVM language, it can do what it wants, and still call Java code. Anyway, I wonder whether that distinction between academic and industrial might be a good one to strengthen. If you make a new programming language project and try to get “users” too soon, you could lose the ability to take the language where you want it to go. And based on the experience of Smalltalk, too soon might be within the first decade. I love my Testsphere deck, from Ministry of Testing. I’ve twice seen Riskstorming in action, and the first time that I took part I bought a deck of these cards as soon as I got back to my desk. I’m not really a tester, though I have really been a tester in the past. I still fall into the trap of thinking that I set out to make this thing do a thing, I have made it do a thing, therefore I am done. I’m painfully aware when metacognating that I am definitely not done at that point, but back “in the zone” I get carried away by success. One of the reasons I got interested in Design by Contract was the false sense of “done” I feel when TDDing. I thought of a test that this thing works. I made it pass the test. Therefore this thing works? Well, no: how can I keep the same workflow, and speed of progress but improve the confidence in the statement? The Testsphere cards are like a collection of mnemonics for testers, and for people who otherwise find themselves wondering whether this software really works. Sometimes I cut the deck, look at the card I’ve found, and think about what it means for my software. It might make me think about new ways to test the code. It might make me think about criticising the design. It might make me question the whole approach I’m taking. This is all good: I need these cues. Is your product true to the image and reputation you or your app’s company wishes to project? That’s really interesting. How would I test for that? OK, I need to know what success is, which means I need to know “the image and reputation [we wish] to project”. That sounds very much like a marketing thing. Back when I ran the mobile track at QCon London, Jaimee Newberry gave a great talk about finding the voice for your product. She suggested identifying a celebrity whose personality embodies the values you want to project, then thinking about your interactions with your customers as if that personality were speaking to them. It also sounds like there’s a significant user or customer experience part to this definition. Maybe marketing can tell me what voice, tone, or image we want to suggest to our customers, but what does it mean to say that a touchscreen interface works like Lady Gaga? Is that swipe gesture the correct amount of quirky, unexpected, subversive, yet still accessible? Do the features we have built shout “Poker Face”? We’ll be looking at user interface design, too. Graphic design. Sound design. Copyediting. The frequency of posts on the email list, and the level of engagement needed. Pricing, too: it’s no good the brochure projecting Fortnum & Mason if the menu says Five Guys. This doesn’t seem like something I’m going to get from red to green in a few minutes in Emacs. And it’s one of a hundred cards.